What’s behind the Pope’s visit to Istanbul? It should always be remembered that the Vatican is a country, with its own king, the Pope. Historically, Vatican meddling in secular affairs has contributed greatly to human conflict. This is particularly true when it comes to the historic struggle between Islam and Christendom. Popes have been instrumental in leading the West against Islam. Pope Francis’ visit to Istanbul can hardly be described as pastoral, as there are only 35,000 Catholics in Turkey. It’s therefore safe to assume the visit was political. What did the pope have in mind? 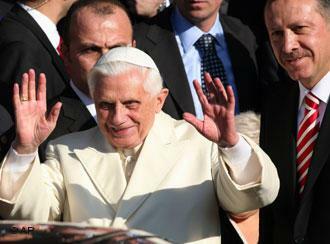 This visit was the fourth time a pope has visited Turkey. The first was Pope Paul VI in 1967. He caused quite an upset when he prayed in the Hagia Sophia, the sixth century church built by the Emperor Justinian. When Istanbul (then called Constantinople) fell to the Muslim Turks in 1453, the church was turned into a mosque. Kemal Ataturk, the founder of the Turkish Repubic, turned it into a secular museum 80 years ago. Pope Francis was careful not to pray in the 1,500-year-old building, not wishing to provoke Muslim sensibilities. The visit was intended to improve relations, firstly between the primary leader of Christendom and his equal, the Ecumenical Patriarch of Constantinople, Bartholomew I, the 270th person to hold the title. Both churches go back a long way. The historic schism between the two occurred almost a thousand years ago, in 1054. Threatened by secularism and Islamic extremism, both leaders talk about unity, but, after a millennium, it’s not likely to happen. This does not, however, mean they cannot work together. The pope is also interested in establishing closer relationships with the Islamic world. Unlike the Orthodox Church, there is no primary leader in Islam, but the pope is concerned about the worsening situation in the Middle East. A century ago, most of the countries that are in turmoil today were ruled from Istanbul as regions of the Ottoman Empire, the same Turkish Empire that conquered Constantinople in the fifteenth century. Istanbul was, therefore, a good place to start to reach some sort of rapprochement with Islam. The pope called on Islamic countries to roundly condemn ISIS and to protect religious minorities in their midst. The whole region has witnessed a great deal of persecution of Christians in recent decades, after centuries of fairly peaceful relations between the two major religions. With the persecutions in mind, the pope should have asked the religiously conservative leader of Turkey, President Recep Tayyip Erdogan, what happened to the Christians after the fall of Constantinople in 1453. The official answer is that their conqueror, Mehmed I, generously gave them the freedom to practice their religion, as evidenced by the presence of a small community today. Only 1% of the country now is Christian. One thousand years ago, almost all the people were Christians. I asked this question a number of times during a visit to Turkey but never got a truthful answer. History shows that while some fled to Italy (and contributed to the Renaissance), most were killed, sold into slavery or forced to convert. It’s what we can all expect if ISIS defeats the West. Is the papacy once again going to lead the West against resurgent Islam? 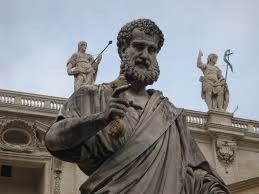 WHAT WOULD ST PETER MAKE OF THE CHURCH? I’m nauseated by the coverage of the change in the papacy. It’s not that I have a problem with the new pope, because I don’t. He seems a very humble man and his focus on the poor is commendable. What’s wrong is not even his fault. I’m talking about the constant references to the “fact” that he is the personal representative on earth of Jesus Christ. It’s also frequently said that he is the 266th pontiff, a direct successor to St. Peter, who started the Catholic Church. If that’s true, then Peter has a lot to answer for! The Catholic Church today sets a very good example in some respects, adhering strictly to conservative teachings that most churches long since abandoned – just as their members have, in turn, abandoned them. 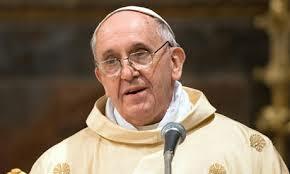 Pope Francis I is only going to boost the church with his stated interest in the poor and his very approachable manner. Leaders of other churches should take note – not all churches are led by what you might call “people-people.” Certainly, religious leaders are not generally humble. At the same time, it has become the accepted norm for religious leaders to live in big houses and enjoy a high standard of living. But the Catholic Church, the wealthiest organization on earth, has not always had the image it has now. Its history has been violent and sordid. You only have to watch Showtime’s The Borgias to see this. (Please note: The Borgias is remarkably historically accurate for a television series.) The Borgias were a wealthy Italian family in the late fifteenth and sixteenth centuries who got control of what was a very corrupt church – and made it even more corrupt. Pope Alexander VI, a Borgia, left his wife behind and took a mistress whom he kept in the Vatican. His son, meanwhile, was made a Cardinal and had a reputation for constant debauchery. Alexander got to the papacy through bribery, threats, and even murder. The political shenanigans that went on would embarrass most politicians in the world today. Even that wasn’t the worst period in the church’s history. In the ninth and tenth centuries, a Catholic monk labeled the government of the church “the pornocracy,” the government of filth. Google that word sometime and you can read all about it. There was even a female pope – a woman masquerading as a man who rose to the highest office and was only discovered when she gave birth to a child while surrounded by a crowd in Rome. 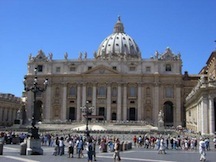 “If Peter came back as a pilgrim, how would he judge what goes on in the Vatican by the standards of the gospel?” This question was asked by a former priest and graduate of Gregorian University in Rome, Peter de Rosa, in his 1988 book “Vicars of Christ” (page 26). He then notes the contrast between the relative poverty of the disciples with the great wealth of today’s church. “Jesus was born in a stable. In his ministry, he had nowhere to lay his head. Today, his Vicar inhabits a palace with eleven thousand rooms. And then there is Castelgandolfo, overlooking the Alban Lake where pontiffs go to escape the summer heat.” Here, in a palace bigger than the Vatican, Pope John Paul II had a private swimming pool installed. “Jesus renounced possessions … Lay up for yourselves treasures in heaven, he said, where neither rust nor moth can spoil it. Christ’s Vicar lives surrounded by treasures, some of pagan origin. Any suggestion that the pope should sell all he has and give to the poor is greeted with derision as impractical. The rich young man in the gospel reacted in the same way.” Will Pope Francis be different? He has already said he wished the Church was poor. At great length, he explains that the papacy’s claim to go right back to Jesus Christ is inaccurate and a convenient misreading of scripture. (I will post something on this on another day.) The legitimacy of the Church is based on this claim and gives them a big advantage over other churches – but it is totally, biblically and historically without basis! Can Pope Francis really make a difference? Two thousand years of history suggests not. His age (76) is also against him. 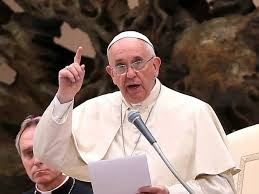 But, if nothing else, he may be able to encourage some self-examination on the part of the government of the Church – the Roman Curia, the bloated bureaucracy that effectively controls the Church. Looking at history, he is unlikely to make it worse. As for television reporters, please read more history and get some depth! 240 years later, the country has clearly changed its attitude toward the Catholic Church and, in particular, the papacy. Whereas the colonists burned an effigy of the pope and kicked a football (soccer ball) made to look like his head every November 5th, the anniversary of a Catholic attempt to blow up the English parliament and its new king in 1605, today’s Americans have been glued to their television sets watching the election and presentation of a new pope with as much interest as in a US presidential election. Unbelievably, there is no questioning Rome’s claims of its special status in the myriad world of Christianity, with its thousands of sects and denominations. A Catholic friend called me the day after the new pope was chosen and told me that his understanding has always been that the Catholic Church was the church founded by Jesus Christ and the reason why some people left the church in the sixteenth century was due to corruption within the church. Take away the corruption, therefore, and you have the pristine church that Jesus founded. “Just as Jesus’ disciples watched Him ascend into the heavens, so his personal representative on earth ascends watched by his disciples today” (paraphrased). Really, somebody should educate these journalists – none of them seem to know any history. As I told my friend on the phone, the church Jesus Christ founded was very different from the Catholic Church. The early apostles went to church on Saturday and observed the annual holy days given to the Israelites at the time of Moses. They avoided the same meats the Jews avoided following the Old Testament instruction they had known since early childhood. After the Jewish revolt in 66-70 AD anti-semitism throughout the empire led to persecution of the early Christians. When the church emerged from that dark period it was a very different church. Two hundred years can make a very big difference. The dominant church two centuries after the Jewish revolt was totally different from the early church; just as American attitudes to the papacy today are the opposite of colonial attitudes in the eighteenth century. In the evenings, we would regularly take our children for a walk around the neighborhood. As fuel was severely rationed, there was little danger from traffic – though the occasional goat could get too close! One of the homes we frequently passed was the residence of the papal nuncio – the “Embassy of the Holy See”. The papal nuncio at the time was described in the national newspaper as “the doyen of the diplomatic corps”. In other words, the senior ambassador. It was his job to organize the diplomats of the various nations represented in Ghana, whenever the Ghana government had something special going on and wanted to invite ambassadors to be in attendance. Arguably, this made the papal nuncio very influential. It struck me at the time that the Vatican had the world’s best diplomatic corps – far better than the United States. In 1979 when the Shah of Iran was overthrown, we were in Ghana. It was a tumultuous year for both countries. The US Ambassador to Ghana was informing the State Department in Washington DC that the pro-US military government of Ghana was stable and that the people were loyal to it. Many of us were better informed – we knew the people were greatly suffering contending with serious food shortages and an inflation rate of over 600%. Non-diplomats were expecting trouble! We were not surprised to learn that the US Ambassador to Iran was informing Washington that the pro-American Shah of Iran was stable and popular. Early in 1979 the Shah was overthrown and replaced by the Islamic theocracy that still rules the country. Some say this event was the start of World War III, which is still going on – the never-ending conflict between the West and Islamic militancy. The then Ambassador’s ignorance cost the US dearly. In Ghana, the government was overthrown on June 4th and a radical, revolutionary government took over, backed by Libya’s madman, Colonel Gaddafi. Other Gaddafi sponsored coups followed in other west African countries. Once again, a serious failure of US intelligence. The doyen of the diplomatic corps was always better informed. In 1978, sensing the failure of communism in Eastern Europe, they chose a man from Poland as pope, the first non-Italian in five centuries. Pope John Paul II contributed to the fall of communism, along with Lech Walesa, Margaret Thatcher and Ronald Reagan. Four decades earlier, cardinals voted in Eugenio Pacelli as Pope Pius XII. Pacelli had strong German connections in a year when the likelihood of a European war was growing. Germany seemed the most likely victor so the church was simply taking advantage of an opportunity. Another opportunity presents itself now. Arguably, the biggest issue confronting most countries is the growing gap between rich and poor. The economic Rule of Inequality is a reliable way of predicting revolution or domestic strife. The bigger the gap the more likely a revolution! According to the Economist magazine some time ago, China is very concerned about this gap and the prospect of instability, so this has become a major focus of concern. There has been a clampdown on corrupt officials in an effort to resolve the problem. According to the same magazine, the only industrialized country with a greater gap is the United States. What saves the US right now is food stamps, unemployment benefits and Medicaid – take these three away and there would be serious rioting across the land. The gap may be great, but the issue was not even mentioned in the last election. 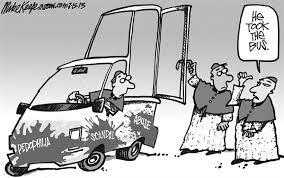 So, the Vatican’s choice of Pope Francis I is astute, showing an awareness of the greatest need in the world at this time – the need for a new economic system that replaces the evils of our present failed system with something more equitable.